So … you want to read a bit about World War I? So, I scanned my LibraryThing collection to see what I have read about World War I. It’s an eclectic mix. I did a fair amount of reading about World War I for the War Through the Generations challenge a few years back, and I’ve continued to read as books capture my interest. Below are five of the nonfiction titles that I really enjoyed and recommend. The title says it all. World War I, in about an hour, so you’re not getting a lot of detail. But it’s a good starter book if you’re dipping your toes back into the events of this time. This was one of my favorites from the World War I reading challenge. The author uses one of my favorite techniques for presenting history: providing an overview and then showing us the individual lives of the pairs he follows in the narrative. This makes for both effective and riveting reading. Yes, I just reviewed this one, which you can read here. I won’t say a whole lot about it, except that I highly recommend it. Lawrence in Arabia: War, Deceit, Imperial Folly and the Making of the Modern Middle East by Scott Anderson. 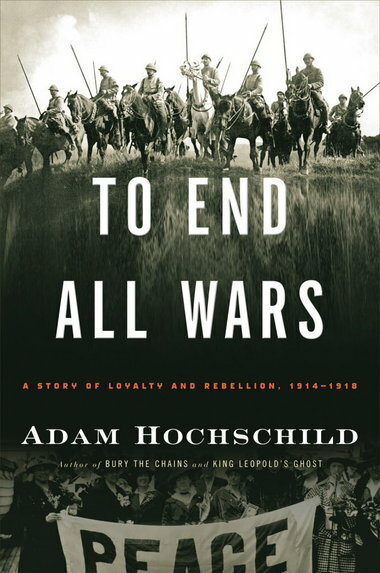 What Hochschild does for the Western front, Anderson does in the Middle East. Want to understand what happened during WWI in the Middle East? Want to understand what the heck is going on there today? This is your book. Anderson employs a similar style as Hochschild by following four principal figures (T.E. Lawrence among them, naturally) through the war years in the Middle East. Again, highly recommended. The Family Romanov: Murder, Rebellion, and the Fall of Imperial Russia by Candace Fleming. A few years back, my son was fascinated by the end of the Romanov dynasty, the Russian Revolution, and in particular, if any of the Romanov children survived. I wish this book existed back then. This is young adult nonfiction, but it’s so engaging and informative, I recommend it to anyone who’d like to know more about the above. For those in the crowd who have read extensively about the revolution and the Romanovs, you probably won’t pick up anything new. However, if you’re like me, and can read about these events over and over (and over) again, then I think you may enjoy this book as well. I know I did. Actually, it reminded me of all the topics I wanted to read more about that had simply slipped off my mental to-be-researched list. There you go. Five books for the WWI centennial. Well, it’s official, hardware and all. 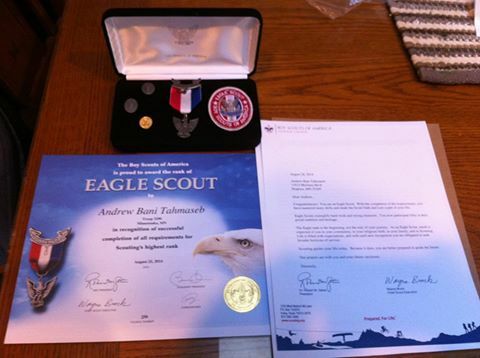 My son is now an Eagle Scout. He worked so hard for this, and the process had its ups and downs, to be sure. We’ll probably have a court of honor in a few months or so. But for now, we simply gaze upon the medal and pins–and that’s enough. In other news, I managed about 3,000 words on the coffee ghost story. I worked through all the audio files for The Fine Art of Keeping Quiet. The Maze is done, and according to my dashboard, headed for retail (!). Also, I wrote up a book review this week (see link below). And I may do another post in a bit to recap all the WWI books I’ve read in the past few years. In time for the 2014 centennial of the start of the Great War, this book brings to life the brave and often surprising exploits of 16 fascinating women from around the world who served their countries at a time when most of them didn’t even have the right to vote. Russian peasant Maria Bochkareva, who joined the Imperial Russian Army by securing the personal permission of Tsar Nicholas II, was twice wounded in battle and decorated for bravery, and created and led the all-women combat unit the “Women’s Battalion of Death” on the eastern front; and American journalist Madeleine Zabriskie Doty, who risked her life to travel twice to Germany during the war in order to report back the truth, whatever the cost. Introductory material opens each section to provide solid historical context, and each profile includes informative sidebars and “Learn More” lists of relevant books and websites, making this a fabulous resource for students, teachers, parents, libraries, and homeschoolers. Back in 2011, I read and reviewed Women Heroes of World War II: 26 stories of Espionage, Sabotage, Resistance. 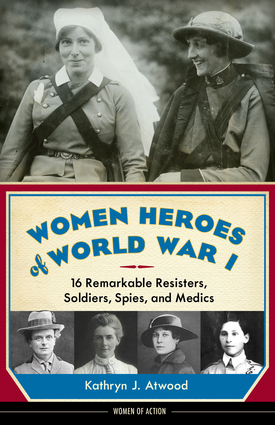 A few months ago, the publisher contacted me and offered a copy of Women Heroes of World War I: 16 Remarkable Resisters, Soldiers, Spies, and Medics. My only regret in saying yes is it’s taken me so long to post my review of this terrific book. Like its counterpart, this book contains several true stories, all centering around women during World War I in the European theater. Its structure is similar. The book begins with an overview of the war and how it began. For the seasoned history buff, you won’t find anything new. However, the overview is easy to follow and will help anyone not familiar with why World War I started. Also scattered throughout the women’s stories are sidebars of extra information that help put the stories and the era into perspective. World War I really represents the crumbling of an old era into our modern one. Sometimes that’s difficult for younger readers to understand (witness the outrage when my daughter learned how long it took for women to get the vote). One thing I appreciated about this book was how varied the women’s stories were. There were a few I was unfamiliar with, and I’ve done a fair amount of reading about WWI. These two books are part of the Women of Action series from Chicago Review Press, which I plan on reading through during the next several months. If you’re looking for accessible and meaty nonfiction about women’s involvement in World War I, I highly recommend this book. Thanks to Chicago Review Press for providing a review copy of this book. So last night I finished my last book for the War Through the Generations 2012 WWI reading challenge. I read seven books in all, which is the most I’ve read for this challenge since I started doing it. I signed up for the “wade” level of 4 – 10 books, so I accomplished that quite comfortably. And I still have more WWI books I want to read. Even so, I plan to sign up for the 2013 challenge: The American Revolution. It’s perfect timing since this spring, Kyra’s class does a huge unit on the American Revolution and we plan to do the reading challenge together. Fantastic middle grade novel that should appeal to adults as well. One of my favorite constructs–the story within a story. This one is on audio as well and would make a good summer road trip book. I discovered this one thanks to a Facebook post. Yes! Facebook! Good for something. WWI mystery. If you like the Maisie Dobbs series, this is a good choice for historical/WWI mysteries. Not really connected to Downton Abbey, but still interesting. 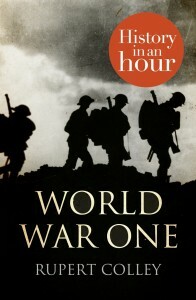 This book is exactly what it claims to be: a concise overview of World War I that you can read in an hour or so. Interesting if ultimately tragic (what else could it be) story about female ambulance drivers on the Western Front in WWI. Helen Zenna Smith is a pseudonym for Evadne Price, who had an interesting and varied writing career. Read more about her on here on Wikipedia. Book #6 for the War Through the Generations WWI reading challenge, which means I have thoroughly “waded” into the challenge–and feeling quite proud of myself. World War One: History in an Hour is exactly what it claims to be: a concise overview of World War I that you can read in an hour (or so–I spent about an hour and a half reading). It is also a better book to read at the start of a WWI reading challenge, not closer to its end. That being said, it’s a great place to start if you don’t have a passing familiarity with WWI, or haven’t done any serious reading on the topic since 11th grade world history. The narrative style is engaging, and the book itself is broken into sections, which makes it easy to set down and pick back up again. The author doesn’t go into any great depth, but again, that’s not this book’s purpose. The book also includes short biographies of some of the major players in the war along with a timeline. So, if you’re looking for an introduction, or need a quick read to round out this year’s challenge, you can’t go wrong with this one, especially if it continues to be free on Kindle.